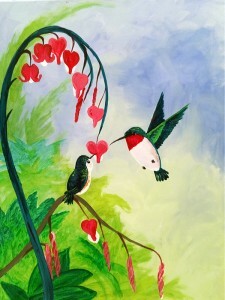 Come in and paint “Hummingbirds” with us! One of our fun instructors will paint along with you, teaching you step by step over the course of this two hour event. Canvas Painting $38.00 One 16x20 canvas for one person. Couples Diptych $78.00 Each person paints half the painting on their canvas so they can be hung up together. Couples special comes with two house wines or beers. Kids Canvas $28.00 11x14 canvas for kids.